Finally, the weather is on our side! 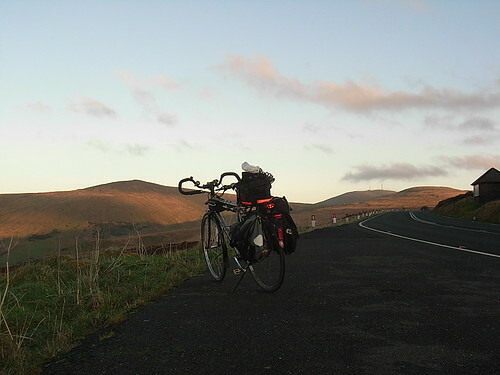 Sunshine and no wind, what more could a cyclist ask for at the weekend. During the week, Paula, one of my cycling friends invited me to join her on the Scone Run. The Scone Run is an organised weekly ride by one of the cycle clubs on the Island. 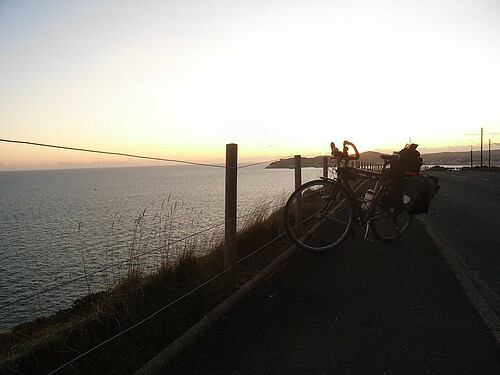 Its a totally social ride, with the emphasise on getting out and about with your bike. Distance is normally about 20 miles and on the flat landscape of the Northern aspect of the island. There are two of these rides in the north of the island on a Saturday morning, the fast cyclists – often in training, who average more than 18mph, and the Vets, an older sect of cyclists, more interested in view, and chat but who still manage to clock a good 14 mph on a good run out. Now that some of the mtb girls have their road bikes, they are getting a bit keen to stretch out their speedy machines. Tina, and Fiona wanted to cycle with the fast riders, but for me, keeping up with the Vets on their road bikes is hard enough... I am after all on a touring bike, and one that weighs in a hefty 38 pounds unloaded. There is no way I could average 18mph, unless I was going downhill. When I lived in Sulby, I used to cycle each weekend with the Vets, so knew the type of cycling they do, so I jumped at the chance to get a ride out with them again. Chas and I moved to Baldrine last November to be near his ageing mother, who has Alzheimer's, and needed us to care for her, we live next door to her now. As we are about 12 miles from Sulby, I thought I would cycle to the ride. The Scone Run is about 20 miles long, and these days, I am always thinking of ways to up my miles, so cycling to the event is just the way to do it. The road to the Mountain, was upwards of course, and I set off nice and early. The Scone Run starts sharp at 10am. So I would have time for a rest, I set off at 8.30am to arrive at about 9.45am. The morning was simply splendid. I have not been very well over the past week, and so I took it easy. The wheels turned making their comforting whooshing sound on the tarmac beneath, and I rejoiced in the morning sunshine, cool and liquid on the horizon, casting long shadows as I pedalled forwards, my breath hanging in the morning air, only to waft past me as I energised my legs (powered by a bowl of porridge and sultanas earlier) onward and up the Mountain. The 12 mile route to Sulby from Baldrine is exactly 6 miles upwards, and thankfully 6 miles downwards, a 14% hill in between the effort of it all and a climb of about 300 meters. The Mountain is not a pleasure to cycle on unless you are on it nice and early, its a fast stretch of road on the island with no national speed limit, the cars bomb along, often over taking one another as they over take you on your slow tourer. From time to time, double white lines make the space between cyclist and car a bit narrow on some occasions. I avoid this road after 9am on the weekend when ever I can, but it does shave off 6 miles. 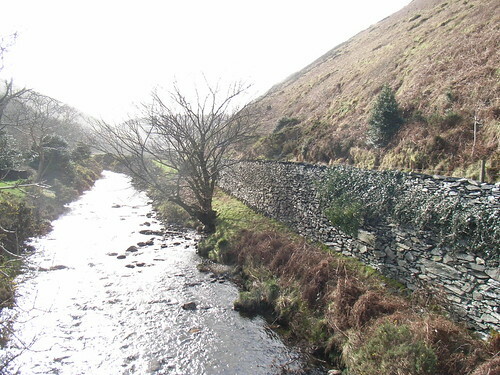 The coastal ride is nearly 17 miles long from home to Sulby but just 12 if you nip over the hills. As it happened today, all the traffic was driving towards me, onward to Douglas, for the seasonal stress of Christmas shopping. Thankfully, I was going in the opposite direction. Taking the Sulby Glen road off the Mountain, means the route became quieter, more peaceful, rural of course and best of all.... downward. It must be the only 'A' classified road, anywhere in the British Isle, that is so narrow in places that cars have to give way to one another, and has a weight limit of just 2 tons. But its one of the most scenic routes on the island. A cleft in two hills, carved out eons ago by the glacial ice floes that sculptures the Northern Plain of the Isle of Man. 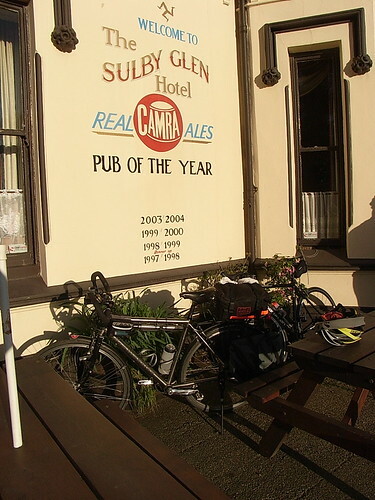 Arrived at the Sulby Glen Hotel in good time, the pub is a famous TT icon establishment. Made our scone order. The scones are made, mixed and cooked while we are on our ride out, so couldnt be fresher, and frankly couldnt taste better. The ride is about 19 miles of flattish cycling and took us round the Northern Plain. Back later at the Sulby Glen, we met up with the earlier, faster riders who were tucking into their post cycle delights, and promptly were invited to next Sunday's mountain bike ride Christmas dinner at the Sulby Glen. Having said our goodbyes, I embarked on my journey home. Taking the bike into Douglas to do a bit of my own Christmas shopping (hence the luggage bags). It was almost dark by the time I got home, the sun sinking behind Douglas head. A brilliant day out, cycled 56 miles in total, and got some shopping to boot! Posted by Mary on December 13th, 2009. AAGGGhhh done it again! Sorry folks, Patrick is going to fix this! Hi Mary. All fixed. As well as adding the "more" thingy, I uploaded your pics to our CycleSeven Flickr image hosting account, then I put them in this page as explained on adding images. Your originals were very large files, and doing it this new way reduces them to smaller sizes much faster to download into the page. Also, if you click the images, it will open them up in Flickr so you can actually view the large original size – and so can anyone else. If you aren't using Adobe Photoshop to resize and optimise your images for the web, the Flickr option is good. It's probably good either way. Good story, and nice pics! I love scones with butter and marmalade. I don't cycle over 50 miles in a day very often. I'm also a bit lazy in the mornings. The thought of setting out at 8.30 am would probably give me a sleepless night. Good story. 56 miles to go shopping? Gosh you're serious! Are you well now? I know you've been poorly. I hope everything's ok with you. A friend and I hired bikes many years ago when the ship we were on visited Douglas – Summer 1976 if I remember correctly. We rode out to Laxey to see the wheel. I wish I'd gone further as IOM seems such a lovely place. That evening, we went to the Casino as there was cabaret and entertainment. I seem to remember Lyn Paul – ex New Seekers, the blonde one – topping the bill. (That's showing my age!) She sang "You won't find another fool like me, babe." It was some years later that I started to take my bike on trips abroad, so if I'd have had it then, I'd have been all over the island and perhaps missed the lovely Lyn! The bikes we hired were just heavy shopping bikes, not conducive for touring very far. Hi Mick, I live on a roller coaster these days. When I was feeling so bad, my thyroid was totally under active. I came off my medication for a week and finally my thyroid kicked started its self again. I am back on carbimizole, but on a half dose. Its back on its way up again, I can tell, as I get heart palpitations at night, but to be honest, give me hyper any day of the week, compared to the horrible hypos. Its like night and day. At least with a bit of hyper I can still function. It was a hot summer in '76. The island would of been a lot quieter on the roads than it is now. I think the Casino still exists? Not sure, its not my thing, but I think its still there. Lady Isabella (Great Laxey Wheel) is still turning of course, in fact the washing floors have been refurbished as they would of been in the Victorian days. Laxey is a wonderful village. One day, I intend to check out your neck of the woods, maybe in 2011. Great account. I hate porridge!! My daughter assured me that I would like her cinnamon-flavoured variety. It was worse.